I decide to max out my learning experience for the day and give the subway a try alone. My friend Elaine has just returned from visiting Paris, and she says the Paris Haute Couture Exhibit is a must. Elaine knows life in general, culture in specific and fashion in exceptional detail, having been a fashion history instructor. She knows these things, so I know I must go. There are no subways where I live, so I haven’t had a lot of experience on them. My subway pass is in two parts. One is a photo ID; the other is a card. I’m not totally clear on how the card boogie is going to go down, but I study the subway routes and figure out I need to take the 4 toward D’Orleans and switch over to the 1 toward Chateau Vincennes for a couple stops. I toy with the idea of not doing the switch, but I decide that would be cowardly. I didn’t come to Paris to chicken out. I study the guy in front of me to see what he does. Wherever I can, I try not to be too bumbling, since it does annoy the French. Imagine millions of people descend on your town every single day of every single year, and you can think how annoying it must be. So I watch this guy and determine that it’s a scan situation. Bingo, I’m in. And when you switch qualifying trains, you don’t need to rescan; you’re in for good. I can almost make out the stops as the instructor is saying them, which shows some improvement in my French listening skills. It would really help if the French pronounced all of the syllables, but I guess dropping the end off nearly every word is why it sounds so charming. Anyway, it helps a lot once you realize the stops are on the side of the subway car and also the walls of the train. Stress level down; I can keep track. Chatelet stop is about 8 ahead; the switch to the next exit is easy: Hotel DeVille, which is exactly where the Haute Couture exhibit is. Now here’s another thing about the exhibit: it’s free. You can walk anywhere in Paris and see the beautiful architecture at no charge, but other than that, most everything is expensive. I forgot about standing in line outside for events in Paris. The Haute Couture exhibit is a 45-minute wait, but I’m on vacation, so that’s fine. While in line, I notice that the French are not quite as charming when they’re in line. They do not observe the “no cuts” rule very well. Four different people inched around me in the long line while I was waiting. I assume they were all French, because they were all speaking it. Please note that I was not dilly-dallying nor being a slacker. When the people ahead moved, I moved. The four people were just cheaters, pure and simple. The guard only lets in about 15 people at a time. Tick-tock. Finally, it’s my turn. Elaine was right. Of course. It’s a great exhibit. Starts off with a bunch of photos of famous French designers’ hands, videos and history. It was all in French, so I scoped out the photos and moved on. My French vocabulary isn’t very sophisticated in fashion yet, shocker. I figure just being able to pick out chaussures and robes in the paragraphs wouldn’t tell me much. There was an amazing 1900s Titanic-style dress in a showcase and some cool video footage of some of the famous designers. And then I was in THE ROOM. OMG, there were some amazing gowns in there. The exhibit was much larger than I expected. Lanvins, Schiaparellis, YSLs, Balmains, Cardins, Madame Grises. All couture and truly spectacular. Not a dud in the lot. It was hard to choose, but I’d say my favorites were all pink … a pale pink 1967 Balenciaga gown, an YSL bubble gown in a similar pink and a hot pink Schiaparelli cape. Plus many of the Vionnets were to die for. 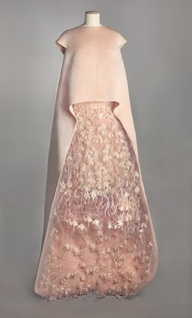 The Balenciaga gown just blew me away. Most creative dress I’ve ever seen that was also beautiful, wearable and flattering. Amazing lines, a sheer cover over a short front, and a back cape drape that hit the ground and fanned out about a foot in a semicircle. Stunning. Some of the dresses in the exhibit were not behind glass cases, and it was nice to be able to get close enough to appreciate the hand work that went into them. Only bummer was that they didn’t allow cameras, even without a flash. Kind of amusing, because they let people take pics of the art in the Louvre, but god forbid you photograph a Givenchy original. Kind of irritating, too, because there was a pro photographer in there taking shots WITH a flash, so it wasn’t about protecting the fabric. Not to mention I’d lugged my heavy camera there only to be rejected, sigh. Still worth it. Exhibit is only two more days. Get there if you can. I repeat, FREE. You can check out many of the dresses on exhibit here; fabulous photos. On the way back, I go into the basement of a Home-Depot-like store with something like a Saks on top. You can’t quite appreciate how exciting and opportune the former is, since I’ve walked about 20 miles of streets since I got here and have yet to see a hardware store. My apartment does not have air conditioning, so I’ve been on the lookout for an electric fan. Few French people have any idea what one is, which is amazing because air conditioning is rare in Paris. You’d think they’d be all about fans. Must have asked 10 storekeepers where to find one; no luck. But today luck was with me. I scoop up one I can manage on the subway and head home, asking a woman in French which way the subway was going. I was kind of relieved when she asked, in a very strong English accent, if I spoke English. Translating all day is hard work. Trip back was without any complications. I’m taking it as a sign that I’m starting to get acclimated.